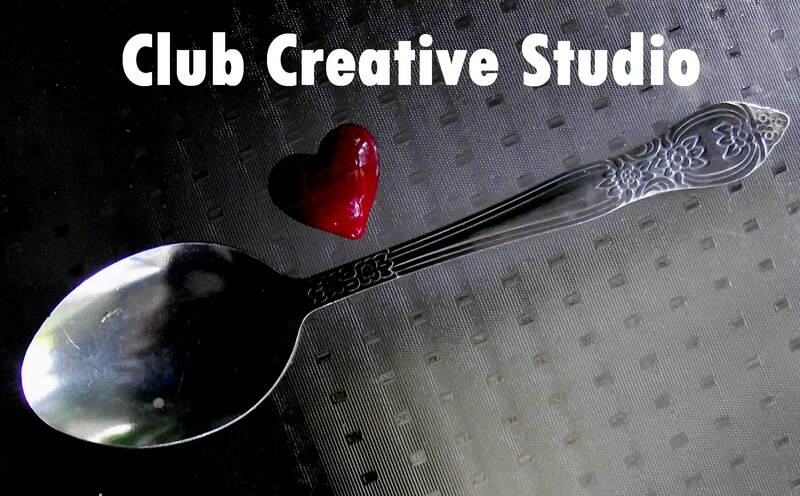 Club Creative Studio loves an artistic challenge. 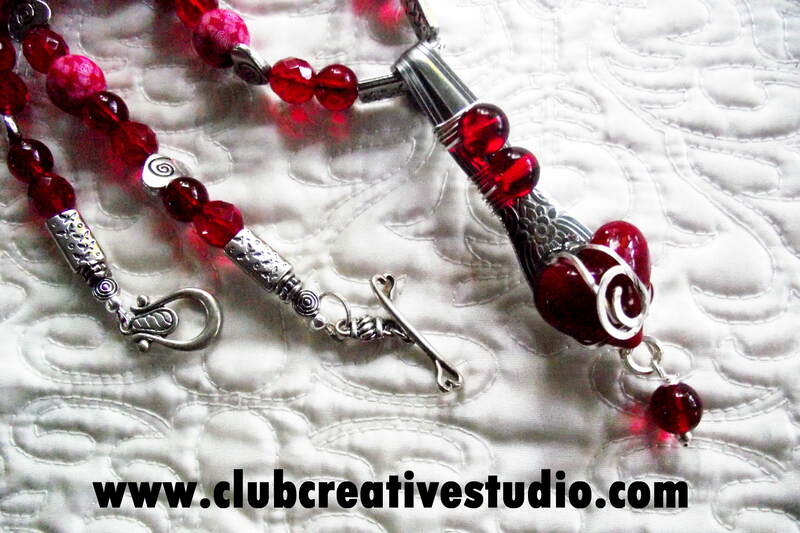 Looking at items in a different way opens doors to creative thinking and possibilities. Yesterday on my way home from a run, I found a few unrelated yet wonderful items that I just knew I could combine and connect in some manner. 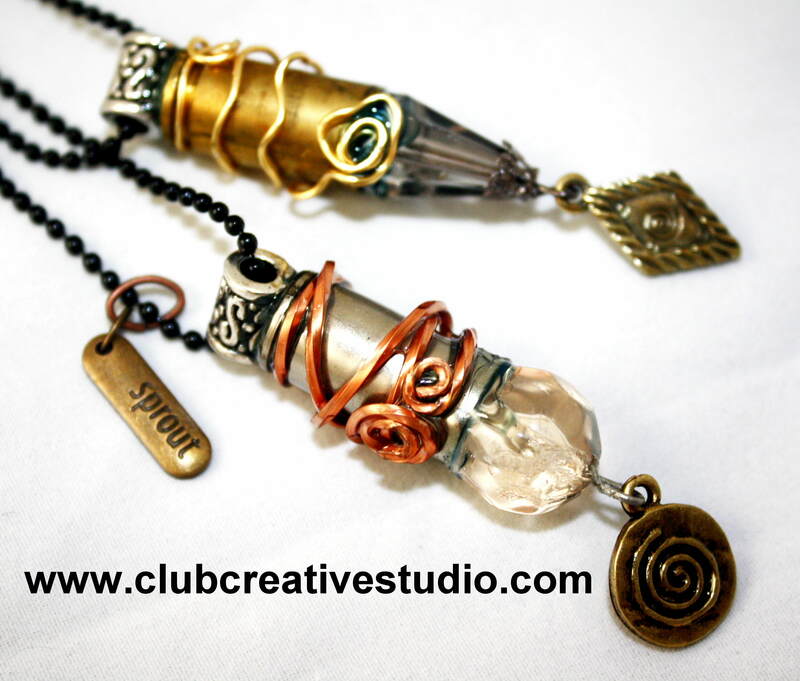 It seems that if I can’t make jewelry from items, I want to at least do something else creative with it. I picked these items off the street as misplaced “junk” and knew that with a little TLC, it could be turned into jewelry. As I looked at the findings for a split second, I knew EXACTLY what I wanted to try using the old discarded metal spoon and the glass heart fob. I thought this project topic would make a great TWO-CENT TUESDAY post since the found components were very low-cost… FREE from my discovery. As soon as I picked up the items I thought: “Finders…Keepers”, what a lucky day for me to have an opportunity to turn junk into jewelry. 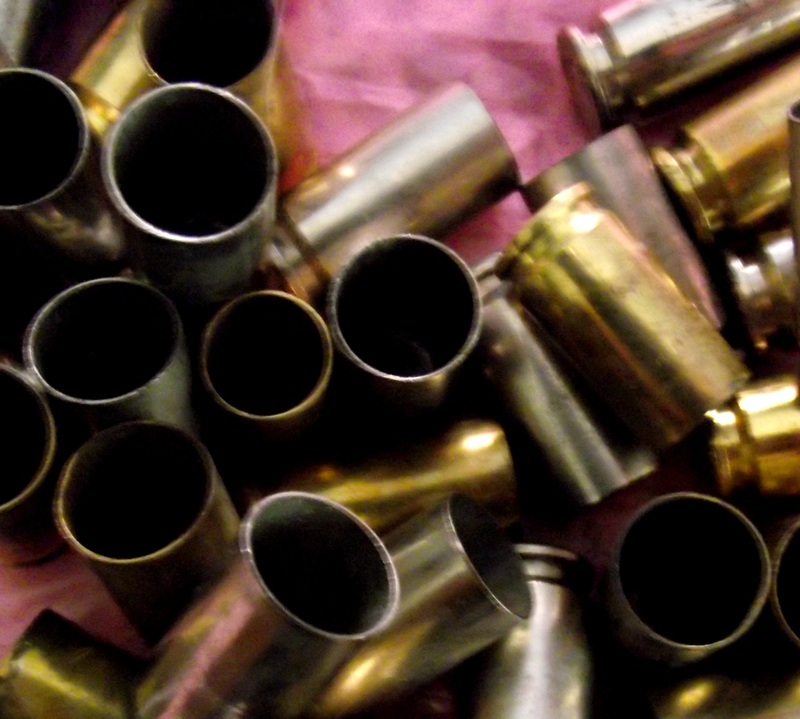 Although they were random items to find on a street, I thought that I found real TREASURES! And FREE to boot! Finding materials that are uncommon or are actually considered to be “found” objects are great because you can’t beat FREE! Plus, it pushes your imagination to be creative. To put strange and unrelated items together is the ultimate challenge to figure out how to take something low-cost and turn it into something of actual worth or visual value to someone. 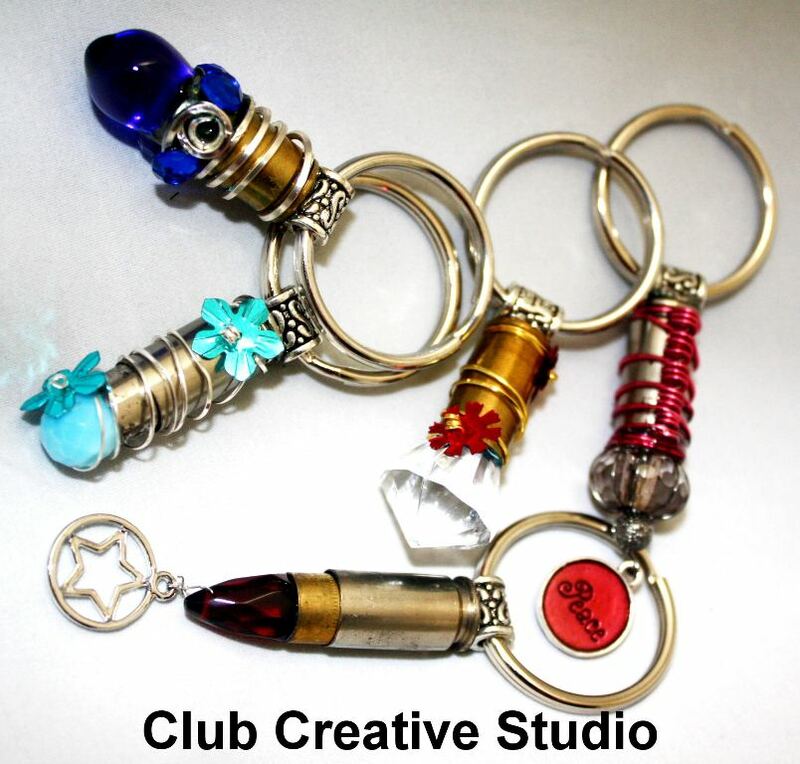 Looking at a spoon and a glass fob like these, would you know what you would initially do with them to transform them into a new and useful item? 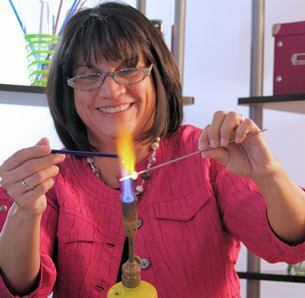 Happily, I share what I did as I envisioned using these items to make another unique one-of-a-kind jewelry art piece. What do you think of stage two? 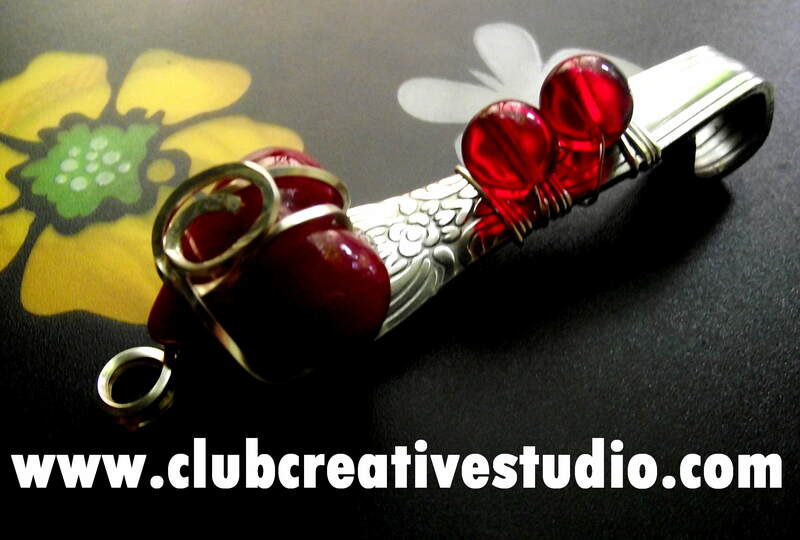 I added wire and glass beads to the end section of the spoon. with a few more additions, I was able to complete my necklace. 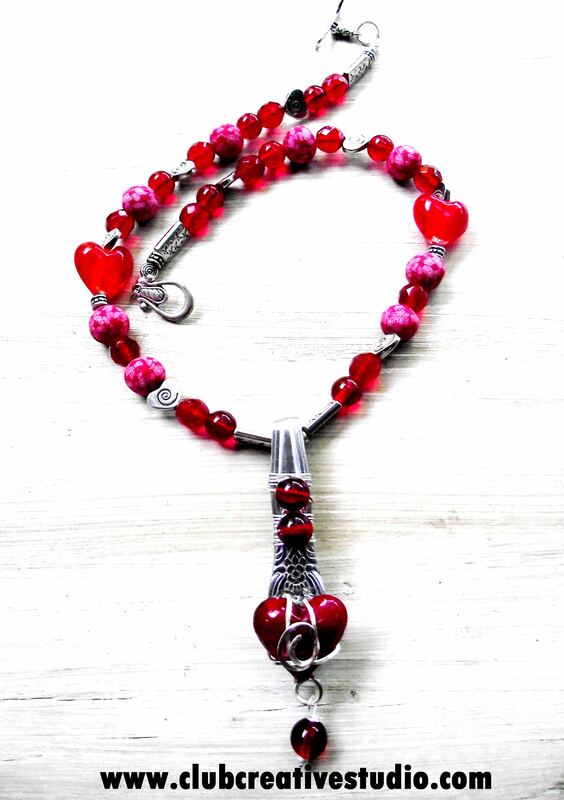 Using red and white hand-rolled clay beads, additional glass beads, a few formed glass heart beads and silver-tone findings and charms, the necklace is now a unique item. Let me know what you think! Whenever I am asked to create a custom piece, I love the challenge just as I enjoyed bringing this vision to life. 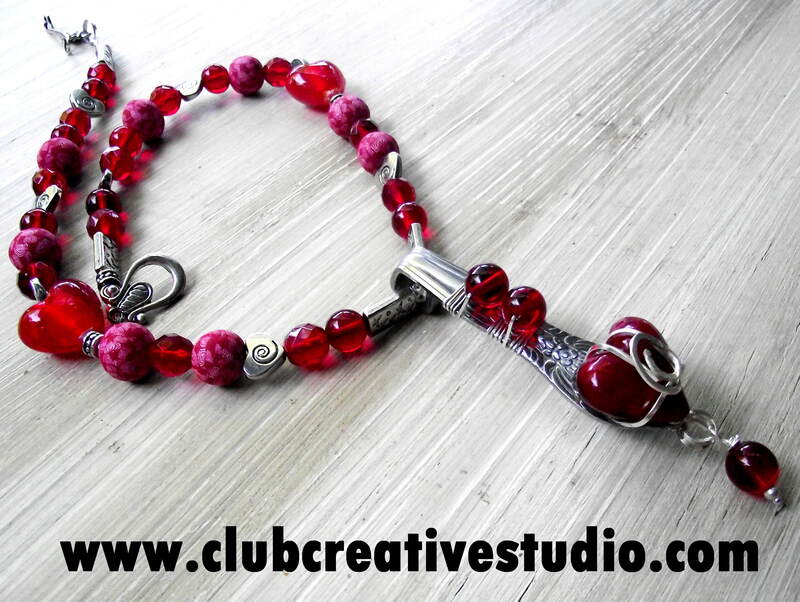 For more creative creations visit the website or drop me a line to let me know your specific jewelry needs. 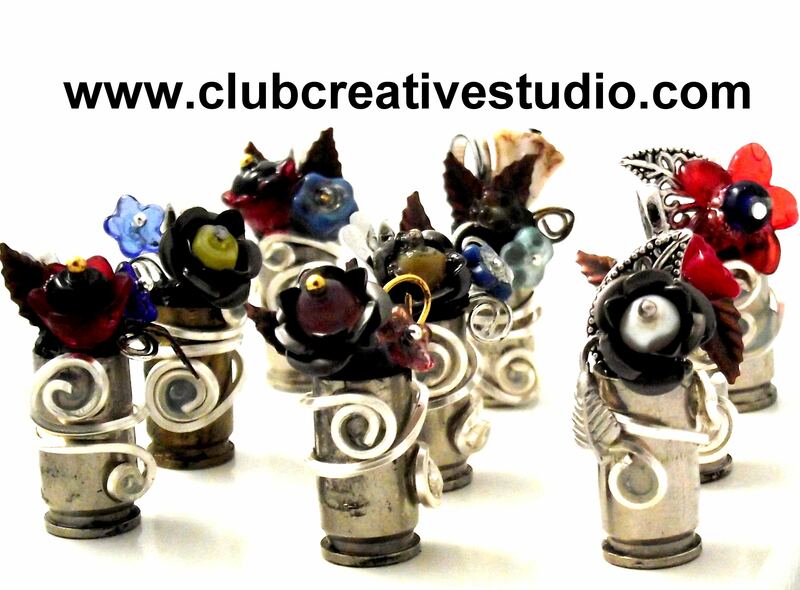 It’s always a thrill to create from recycled or found objects so I welcome your challenges. 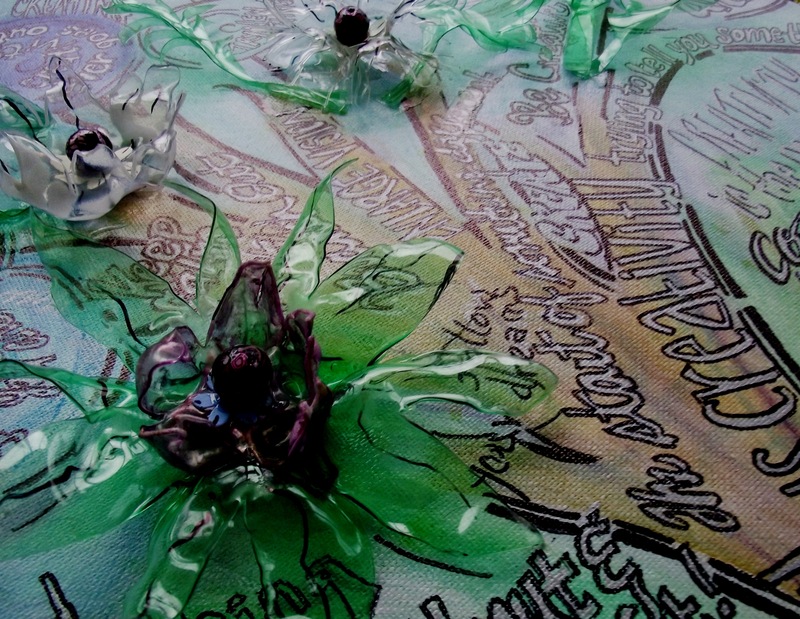 Club Creative Studio recycled and melted plastic bottles were transformed into flowers and added to the painted canvas, along with quotes about creativity. Inspiration comes in many forms. 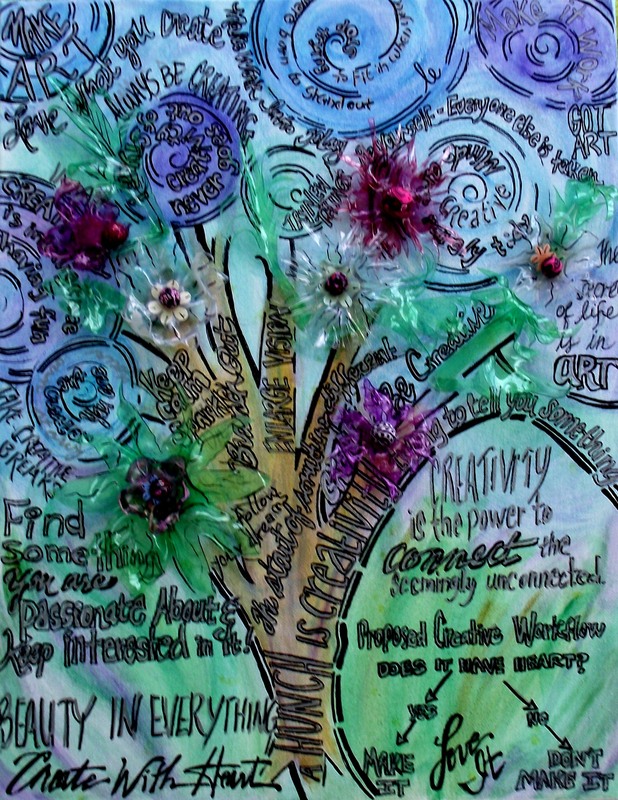 Today’s TNT (This-N-That) post, I hope that these choice quotes on creativity inspire you to be creative in your own way. Recently, I incorporated a small collection of quotes that inspired me to be creative. They were applied to the canvas art project and will serve as a focal point within my creative work space. Maybe some of them will strike a cord with you and lend to a creative spark for the times you need to be inspired by a creative quote. The “Mother-Daughter Project” continues as we add more melted bottle blooms. The goal is to cover the canvas at some point for a complete look. Proposed Creative Workflow: Does It Have Heart? >I’d Like Some Cheese With My Whine! > I love a good creative challenge. I also love when others help me to overcome a task that is ridden with questions. Recently, a friend (Jennifer) collected wine bottle corks and presented me with the challenge at hand. I did not whine for long. How would I approach this magic trick? My mind is racing with a few ideas on how to tackle the first steps. I have found that the pure corks work best for cutting and I was able to smooth the edges with an ordinary finger nail file. After a few trials and errors and after I was able to decide the best method/tool to use to poke a hole in the center of a cork, so that it broke as smoothly as possible. I was able to celebrate knowing it would all come together nicely. 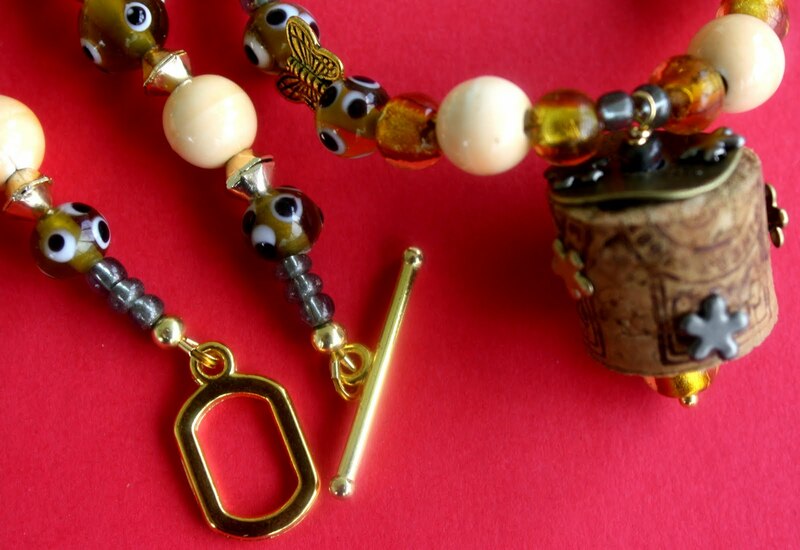 The necklace strand is made with simple wooden beads and spaced with a single seed bead. 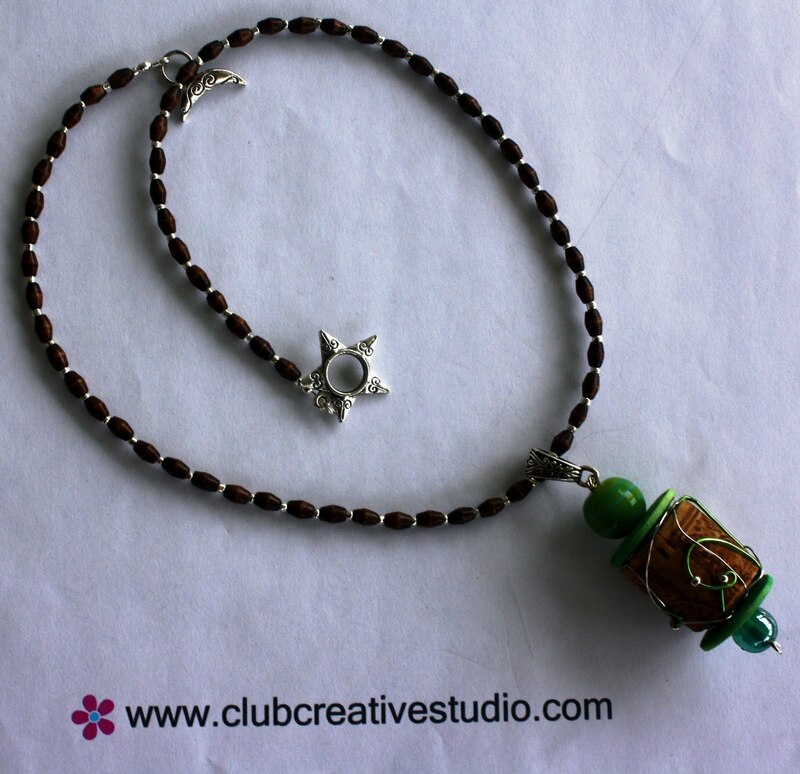 The pendant section is a portion of one cork that is flanked with glass round beads and wooden disks dyed in the color green. 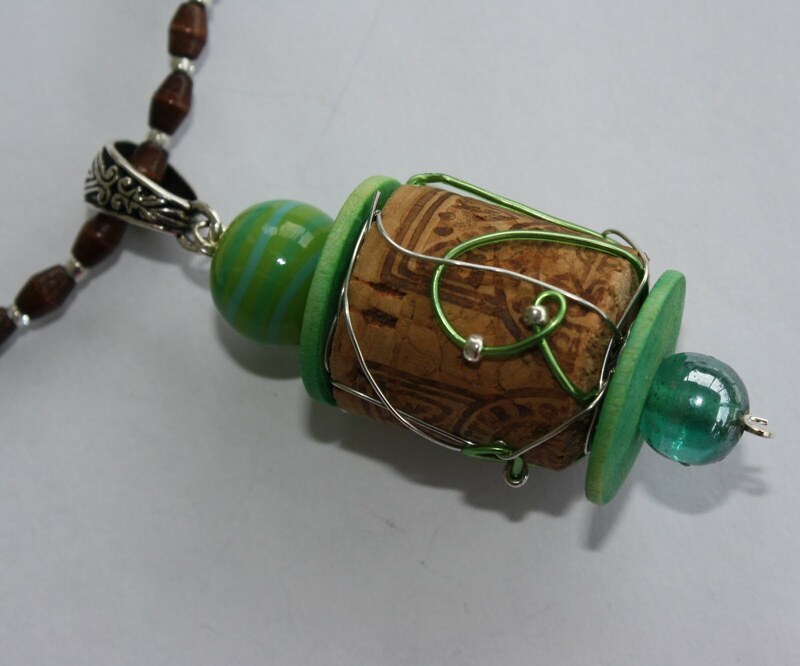 I used silver and green tone wire as wrapped accents around the cork to add a touch of flair and funk. Since this is the first attempt, I am excited to see what else I can create. 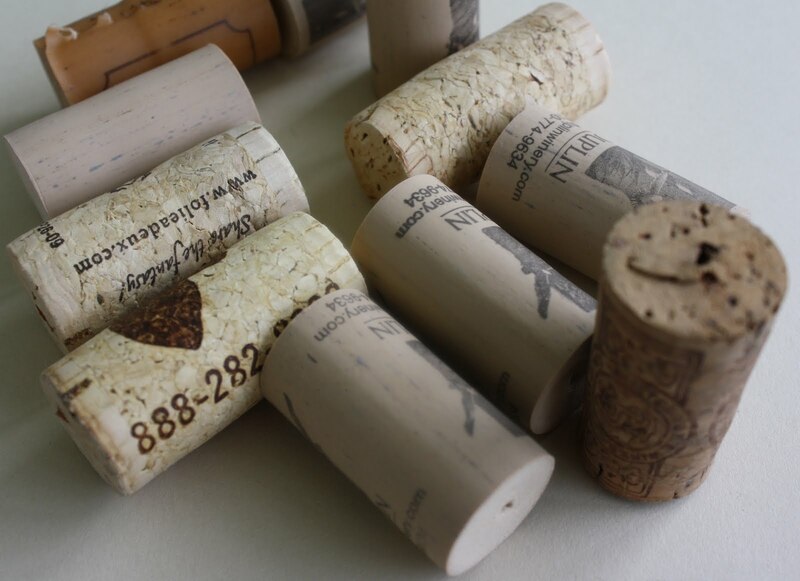 I would like to use the remaining pure cork stops for jewelry and then suggest that a cork wreath be made with the plastic coated corks, as to not waste them but, use to further her wine theme in the home as a decorative item- something different to appreciate with wine and cheese! 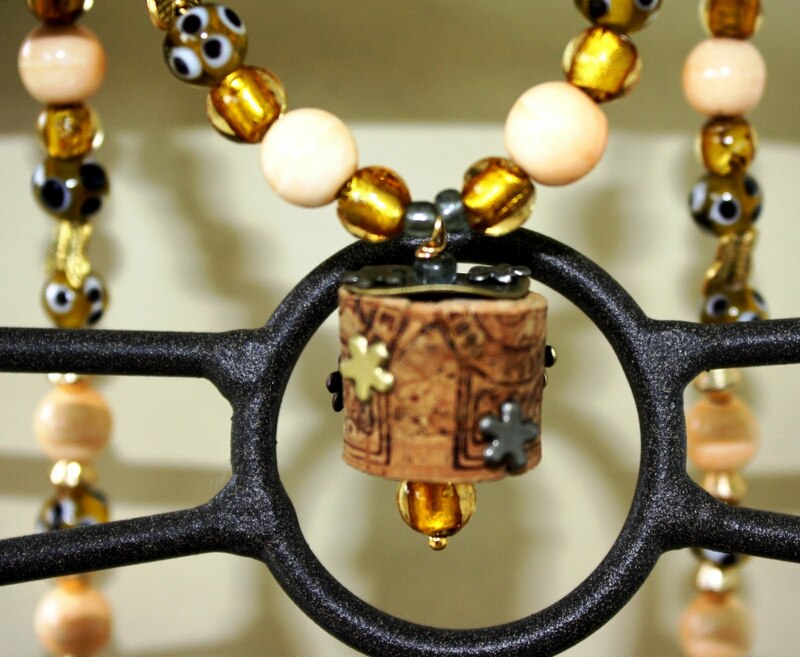 The second project also features a portion of a cork as well for the focal bead. I placed a brass spacer disk on top to make it look a bit industrial and rugged. 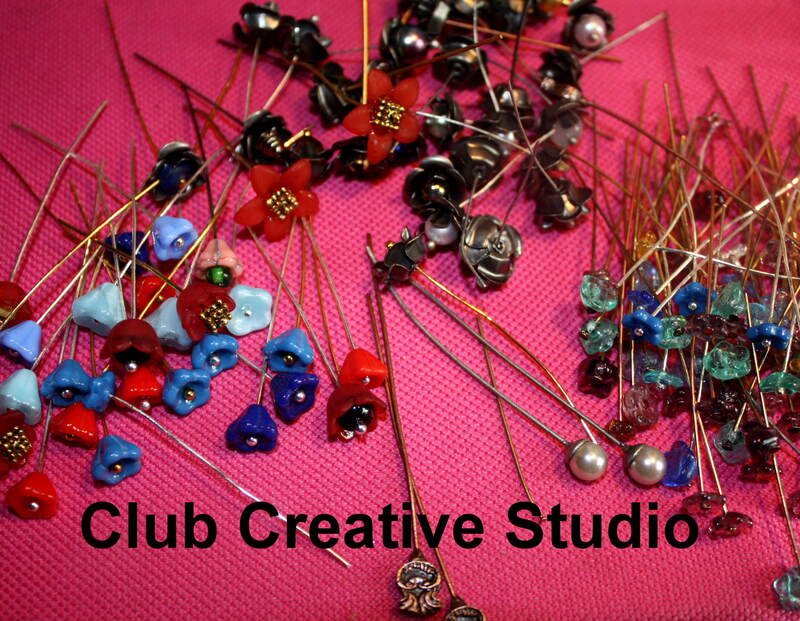 The flowers are decorative brads that I often use in the packaging of Club Creative Studio earrings and it is also represented in our logo design. The brads are secured into the side of the cork with the metal point and a dot of jewelry adhesive. 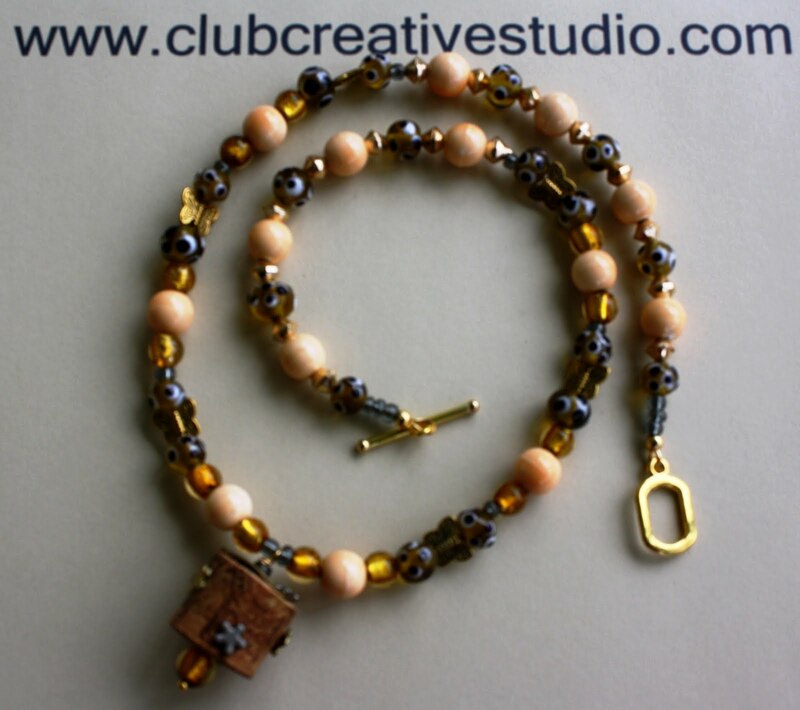 Metal butterfly charms and the hand-torched glass dot beads along with the peach colored ceramic beads finish out the entire look and feel of this necklace. It is unique and as always one-of-a-kind. Thanks for the challenge and I will keep working on improvements and using ideas that are both fun and functional.